A compressor is one of the best things you can get to make your playing sound more even and professional. It’s a simple gadget that plugs inline between your bass and the amp that evens out the tone without altering your sound. We researched some of the best compressors out there and put together this bass compressor buying guide to help you find the right one for you. First, let’s look at some of the key features to keep in mind. LEDs: Most of our picks come equipped with LED lights. Some tell you when the power is on or act as a battery monitor. Other act as a gauge to tell you how close to the compression limit you are. True Bypass: True Bypass is a button or switch that you can engage that allow you to basically bypass the compressor and go straight to the amp. 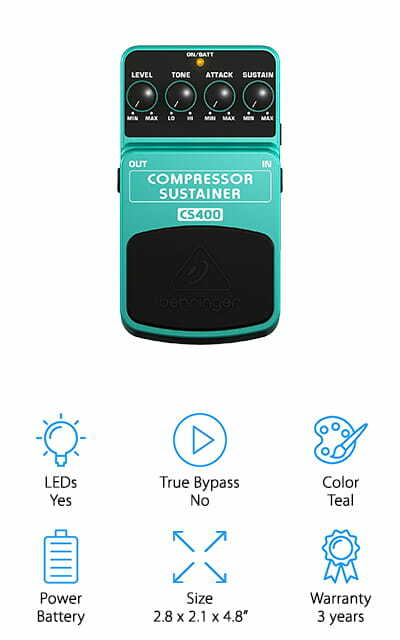 It gives you complete control over when the compressor interacts with your sound. Color: These compressors are available in a few different colors. What color you choose is a little more than an aesthetic thing. The right contrasts can make it easier to see the dials and make the right adjustments. Power: There are battery powered compressors on this list as well as some that can be powered by an adapter. There are even a few that can be powered by both. Double check to make sure an adapter is included. Size: All of these compressors are compact but some are actually tiny. Generally, they’re all small enough that they’re easy to travel with. Plus, they don’t add a lot of weight to the rest of your gear. Warranty: Warranties on these vary from no warranty at all to 3 years. Most of them come with a 1 year warranty. Make sure you read over the warranty carefully, it helps to know what’s covered just in case something goes wrong. Now that you know a little more about what to look for, let’s move into our reviews. We put out top and budget picks at the top of the list so, even if you’re in a hurry, you’ll get a taste of the range that’s available. All of these products are great, though, so stick around if you can. We’ll start with our MXR bass compressor review then make out way down the list. Are you ready? Let’s get to it. 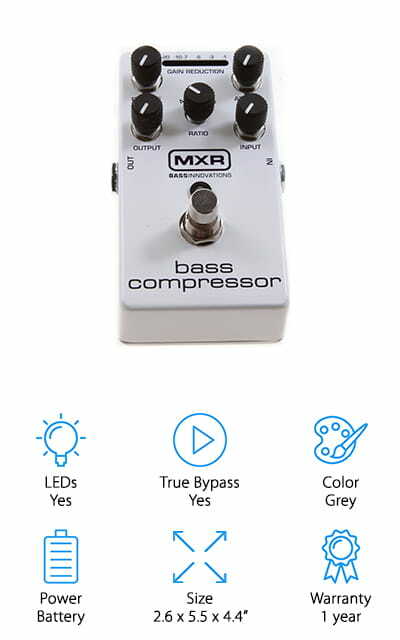 Our pick for the best compressor for bass guitar is the MXR Bass Compressor. It allows you to have full dynamic range until the signal reaches the compression threshold. What exactly does that mean? It won’t compromise your sound. It features 10 LEDs that display your status so you will know when the compression threshold has been reached while still letting your sound keep its character. You’re given a lot of control over your sound thanks to the attack, release, ratio, input, and output controls. 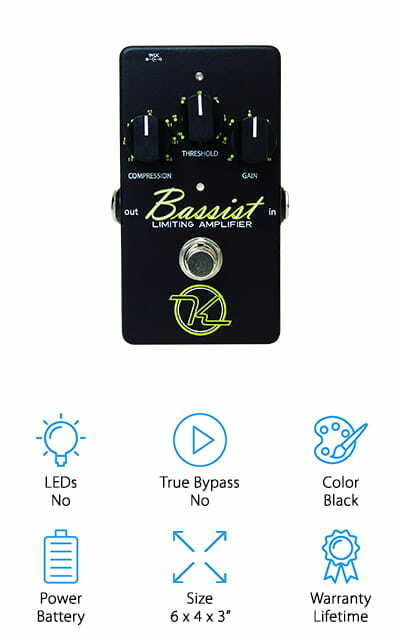 There’s more, it’s also equipped with True Bypass so your sound can go right to the amp when you need it to, just step on the footswitch to make a quick change. Plus, it’s lightweight and has a tough aluminum housing that’s made to last. If you’re looking for a cheap bass compressor, check out our budget pick. 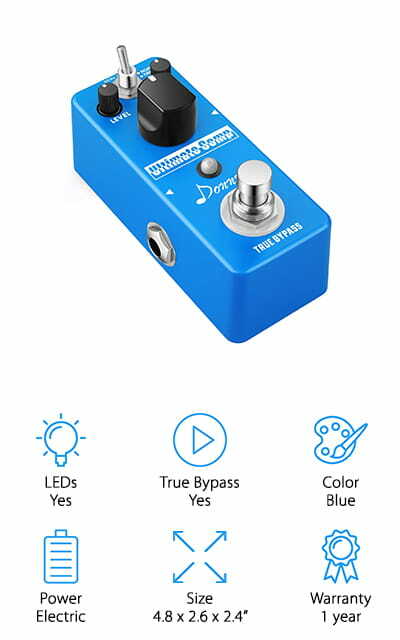 The Donner Compression Pedal has 2 modes, normal and treble compression. You can adjust the volume level, amount of compression, and tone with quick tweaks to the knobs. This gives you a lot of control over your sound. This compressor has True Bypass which allows you to stop it from interfering when it’s musically necessary, all with the simple push of a switch. There’s more, it also has an LED indicator that lets you know when it’s working and out of bypass mode. The housing is made of lightweight, strong aluminum alloy for increased durability. It delivers a smooth, compressed tone while adding punch to your beats. One more thing, it’s a compact size is perfect for travel. Another option for the best bass compressor for sale is this one from Behringer. It was designed to compress the loud signals and boost the low ones for a more consistent sound, all without distorting the original sound. This one also lets you have a lot of control thanks to the level, tone, attack, and sustain controls. Simply adjust from min to max until you get just the sound you want. Go subtle or loud, adjust your highs, and build your sound just so. The LED light tells you when the power is on and warns you when it’s time to change the battery. This compressor can also be powered with a DC power supply, though one is not included. The warranty is pretty great, too. They’ve got you covered for 3 years. The KOKKO Bass Compressor is another good bass compressor that you should take a closer look at. It’s equipped with True Bypass and had a fully analog circuit and a broader adjustable range. Adjust your sustain, level, and attack using simple dials right. The LED lights show the status of the effect so you know where you stand. Because you use your foot to adjust the True Bypass while you’re playing, it’s important that the compressor not move around on you. That’s why this product features a rubber anti-skid bottom. The classic mini size is perfect for travel and the high quality aluminum alloy housing makes this a really durable choice. This compressor is really easy to use but an instruction manual is included just in case you need it. Next up is the Xvive Bass Pedal, a 100% analog design that features True Bypass circuitry. There are a lot of things you can adjust with this compressor, including volume, distortion, and compression. It even includes an optional overdrive circuit and gives an amazing sustain. There’s even an LED light that lets you know when the effects are working. The design is simple and really easy to use. Plus, the bright red and white design not only looks really cool, it’s also really easy to read. The white lettering really pops against the red background which helps the controls really jump out at you. That’s not all, it’s small, compact size makes it great for traveling from home to a gig to the studio without affecting its ability to make a big sound. 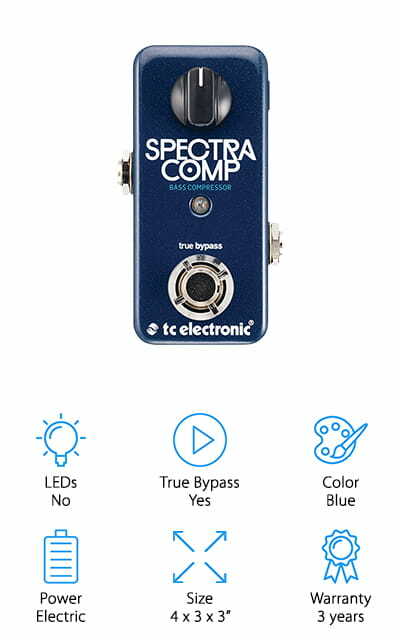 TC Electronic SpectraComp is perfectly tuned for a bass guitar and bring the quality of a real recording studio. The ultra-compact design is portable and won’t get in the way of any other footboards you might use while playing. In fact, it integrates well into just about any setup you can think of. 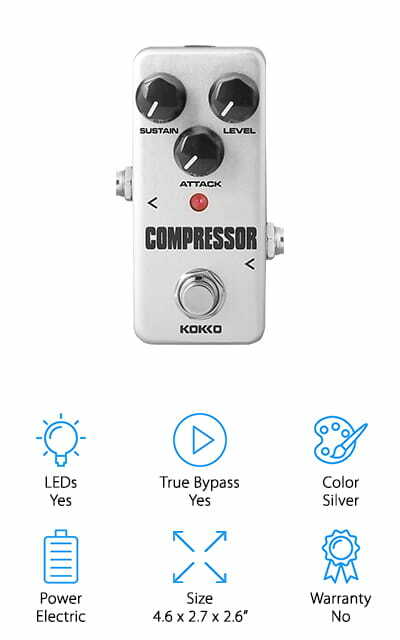 This compressor features True Bypass so you can get your sound to the amp uninhibited when you want to then just use the convenient foot switch when you want to turn it back on. This compressor gives you a punchy tone while keeping your sound even without changing the overall tone. That’s not all, the System 6000 processor makes sure that the low-end bass notes are never compromised or distorted. And get this, there’s even a companion app that provides different compression combinations. 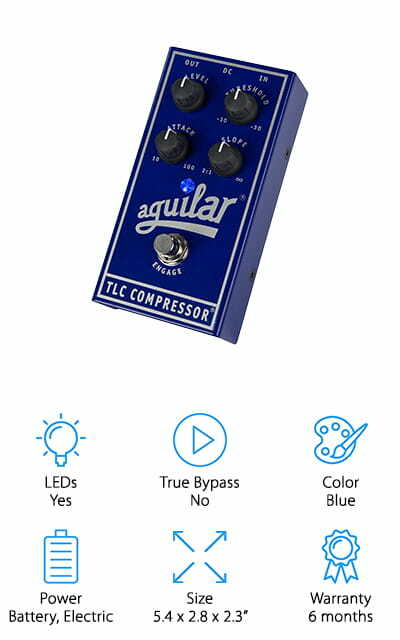 Our next pick is the Aguilar TLC Bass Compressor. They’ve redesigned their case so it’s now even more compact than it was before. Plus, now that it doesn’t have a lip anymore, you can use any right angle plug without having to worry about the barrel size. The bottom of the pedal has a flat surface which makes it really easy to mount to a pedal board, too. It gets its name from the Trans Linear Control (TLC) circuit that packs a lot of performance into a compact package. The 4-knob design clearly displays the controls so you can make accurate adjustments to level, threshold, attach, and slope. Make adjustments until you find just the sound you’re looking for. This compressor delivers studio quality sound in a tiny convenient package. If you’ve been waiting for a Keeley bass compressor review, never fear. Here it is. The KBASS Compressor is expertly engineered to provide compression that stays as true to the original sound as possible. It provides studio quality sound in a small, compact size. With the VCA compressor, you get a lot of control over your sound. You can adjust compression, threshold, and gain without worrying about any bit of the tone getting lost. Keeley provides a sound that is easily amplified and won’t cause clipping or distortion. It also limits distortion from your amplifier and helps prevent any damage to your speakers by limiting the effects of the peaks in the signal from your bass. And that’s not all, the indicator light shows you the threshold so you always know where you stand. 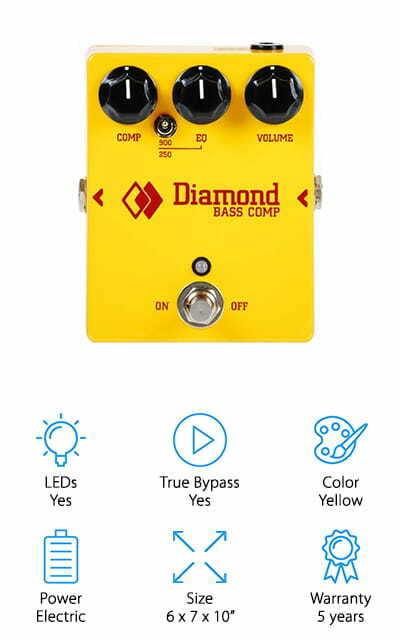 Up next is our Diamond bass compressor review. 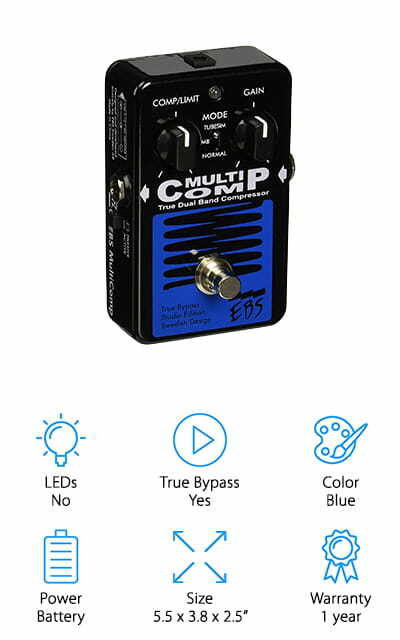 This is the first pedal by the company that’s specifically designed to be used with the bass guitar. It has a lot of really awesome features, like the ability to toggle the Tilt EQ from 900Hz to 250Hz using a mini toggle. 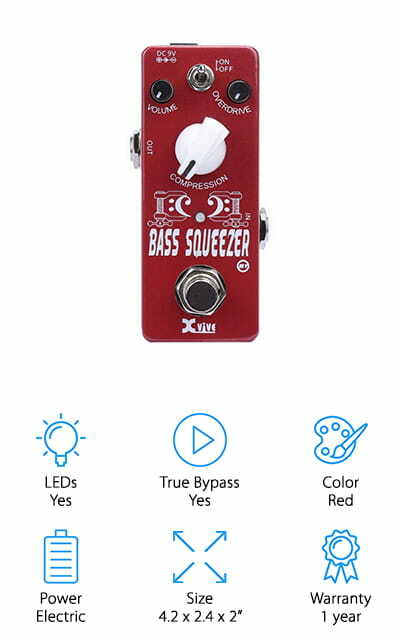 That’s a 20Hz downward extension unique to this model to accommodate deeper bass tones. Another thing we have to mention is the premium components used in the construction of this compressor. They include some of the 1% metal film resistors and an OP amp that’s better quality than industry norms. That’s not all, it also has True Bypass and the 18V power supply is also included. One last thing, this compressor has a pretty impressive warranty. It’s covered for 5 years. Last up is EBS Sweden Bass Compressor, the bass tube compressor that also does multi-band and normal compression. It’s also equipped with True Bypass so you get compression and other effects when you want them. One thing that stands out about this compressor is how easy it is to use. It’s smooth, well-designed, and well thought out. All you need to do is set the compression limit with one knob, gain with another, then chose the compression mode. Plus, if you want a little more control, there’s also an active/passive switch and an internal trim pot. This compressor was first introduced in 1998 and has been updated and improved with every edition, including higher headroom, analog circuitry, and the addition of True Bypass. One more thing, it’s covered by a 1-year warranty.